Cars drive through the Italian Market on October 14, 2018. Philadelphia may be called a "city of neighborhoods,” but it’s also a city of robust public spaces. From Dilworth Park to the four original “squares,” The Porch to Penn’s Landing, they are the lifeblood of our walkable, human-scale city. But often missing from this conversation is another important public space — our streets. This has been brought into sharp focus in recent weeks by a debate over a proposed driveway on 9th Street in the Italian Market. 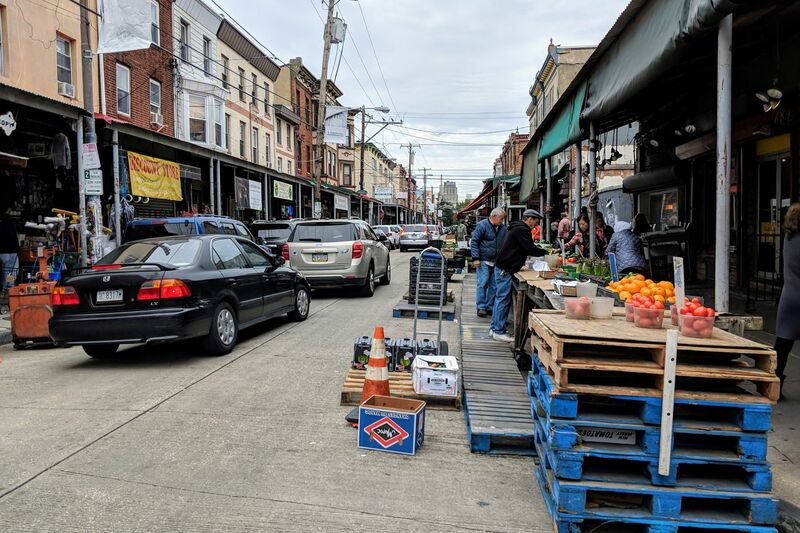 Criticism has manifested in a petition started by 5th Square, which as of April 11 had more than 500 signatures from Philadelphians calling for relocating the proposed driveway entrance to Washington Avenue to preserve a walkable, pedestrian-friendly market. Streets are not just paths we drive on, and they can even be some of the most important space a city offers. Philadelphia’s narrow streets present a unique challenge but also a rewarding urban fabric — a navigable series of alleys and avenues with varying architecture that captures different periods of historical development. A prime example is the Italian Market. A semi-outdoor public market, it is also a bustling commercial street with a somewhat ramshackle quality, attracting locals and tourists alike for staples and famous destinations, from fresh ricotta to cheesesteaks. Most importantly, however, is the variety of visual interest at the ground level. Walking just one block in the Italian Market delivers innumerable things to look at, high and low, beneath European-like porticoes. Stalls and supplies spill out into the street in vibrant, organic fashion — the kind of “street ballet” famed urbanist Jane Jacobs would have been proud of. This sort of interest (visual and otherwise) is what attracts people to the city. It’s about quality of life as we go about buying ingredients for dinner, picking up home accessories, or simply making our way to and from work. A city is a community, and this simple street exemplifies much of that spirit in Philadelphia. Public space research from urbanists past and present tells us just how much humans thrive in these kinds of environments. When a street is like a “room,” we feel more comfortable. When buildings are at a human scale, below about five stories, we cannot only see and hear, but touch (and even taste) the best of the city. When streets are calm and narrow enough to cross frequently and at will, studies have shown that social ties increase dramatically — as does our sense of belonging and happiness. And features like benches and bike lanes, a recent study found, promote greater civic engagement and trust. The Italian Market is already remarkable — but it presents further potential for the future if pedestrianized. The street has all necessary parameters for such a change, with its high pedestrian volume, narrow width, and abundance of everyday economic attractors. Like its upcoming annual festival, one of “Philadelphia’s largest block parties," the conversion could start with closing the street to cars on weekends when more visitors come to the market. Eventually, the market could embody a “shared street” model, which would support our bigger need to reduce reliance on automobiles to make progress on noise pollution, public health, and climate change — to say nothing of our Vision Zero goals of reducing traffic fatalities to zero. People on foot, bike, and mobility devices take priority, with cars only allowed during certain hours for such things as deliveries or special circumstances. Other cities around the world, from Oslo to Bogotá, are pedestrianizing entire downtowns, creating weekly open streets events, and enacting congestion pricing to reduce driving in city centers. Philadelphia has the potential to follow suit, and it must if we are to meet the needs of the future. We are all pedestrians at some point in our day. Where better to start than the Italian Market, a place where people already rule the street? Katrina Johnston-Zimmerman is an urban anthropologist and project manager at the Lindy Institute for Urban Innovation at Drexel University. She is a guest lecturer at the Royal Institute for Technology in Stockholm, Sweden (KTH) and an adjunct professorat Drexel University.